Free Download Paradise Beach 2: Around the World Game or Get Full Unlimited Game Version! Work your way to the top and manage the construction of the world's leading beach resorts in Paradise Beach 2: Around the World! In order to get advantaged of playing Paradise Beach 2: Around the World full unlimiteg game version you must register the game. Once upon a time you managed to become the owner of a resort on a paradise beach. You were the architect behind beautiful gardens, paths, beaches, and bars. Empty beaches came to life and were filled with thousands of happy vacationers from all around the world to enjoy your man-made paradise. 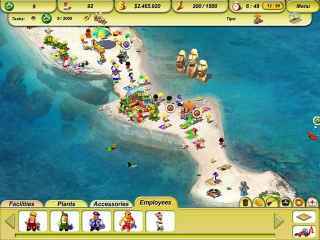 Now you’ve decided to work your way to the top and manage the construction of the world's leading beach resorts in Paradise Beach 2: Around the World, a fun Time Management game! Paradise Beach is an addictive, tycoon-style, click management game where you have been selected to design, build and manage of some of the world's leading beach resorts. Hit the beach in a contest to see who can earn the most money! Beach Party Craze is sure to make a splash with the entire family! Huru Humi mania hits the beach! Help Lindsey earn enough money to enter a volleyball team tournament by catering to her friends on the coast! It's time for adventures at sea with 120 unique griddlers to make your vacation even more fun!